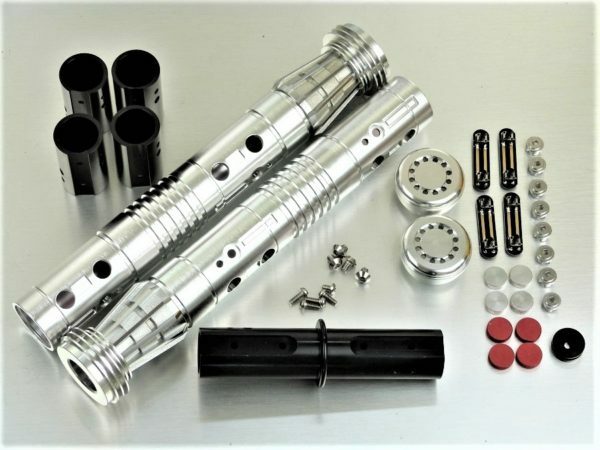 Comes with everything shown in pictures which includes 2 sabers, pommels, a coupler, etc... Has a 7/8" blade socket. This is NOT a complete working saber and does not include blade, LED, sound module, speaker, etc.. Double Body Length – 20.5” (rounded Up To Nearest .25”). Momentary Switches – (Qty 8 / Located under each silver & red button). Single to Double Conversion – Yes / 2 Pommel end-caps included. Vented coupler is available as a separate item.